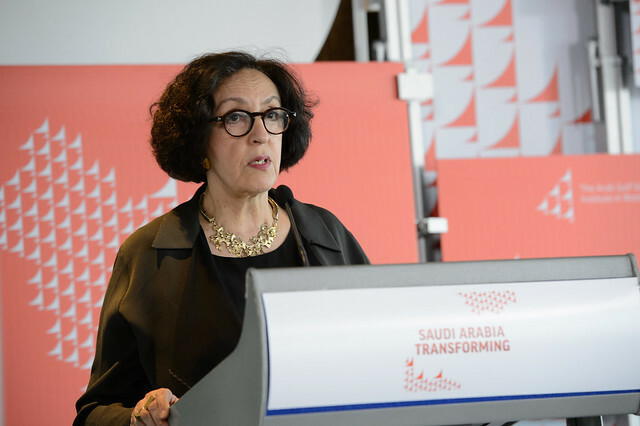 On May 10, 2017, AGSIW brought together thought leaders from the Gulf Arab states, Europe, and the United States to discuss Saudi Arabia at a transformational moment in its history. On May 10, 2017, the Arab Gulf States Institute in Washington brought together thought leaders from the Gulf Arab states, Europe, and the United States to discuss Saudi Arabia at a transformational moment in its history, as the country advances its ambitious reform program – Vision 2030. With a clarity of purpose crystalized by the oil shock of 2014, a year ago the Saudi government initiated wide scale economic and public sector reforms aimed at diversifying its economy, rationalizing its public sector, reducing subsidies, stimulating the private sector, and restructuring its legal and regulatory framework. It also began taking steps to promote a stronger sense of Saudi national identity based on the country’s place as the center of the Muslim world, its unique historical and religious sites and heritage, and multiple other social and cultural initiatives. All of this has been framed by immense regional challenges, a strategic rivalry with Iran, and a military engagement in Yemen that has sapped resources and required the ultimate sacrifice from the kingdom’s citizenry. In the process, Saudi Arabia has created unavoidable social tensions that it will have to navigate in the years ahead. The government has remained conspicuously silent on much of the social and cultural impact of Vision 2030, and the plan lacks clarity on how the government will tackle these issues. The state must find ways to communicate effectively with its citizenry, incorporate more women into its workforce, and provide a space for open expression and a platform for dialogue with the government and an entrenched, conservative establishment. Finally, Saudi Arabia will also need to increase its capacity to engage with a region in turmoil by strengthening both its military and diplomatic core, as well as developing and enhancing foreign relations and alliances. Click here for conference videos. The Saudi government must remain flexible in its implementation of Vision 2030. If it is too rigid it will not be able to properly respond to the changing landscape – domestically, regionally, and globally. Success will require effective coordination, the managing of expectations, and developing rules that can allow policymakers to shift course depending on the changing environment. Saudi Arabia must continue to increase its level of transparency and openness with the markets, building up statistical capacity so data can be analyzed and disseminated. This will allow the government to understand and respond to domestic progress and setbacks, promote foreign direct investment, and continue to raise debt on favorable terms. Rigid austerity measures are not the answer. Saudi Arabia is suffering from revenue constraints from the low price of oil, but cutting government expenditures will only hurt the private sector at a time when the government is trying to encourage the private sector’s rapid growth. Change the relationship dynamic between the government and private sector, putting both on an equal playing field. Maintain dialogue with the beneficiaries of private sector reform to continue to receive feedback that can be addressed through policy adjustments. Take proper advantage of the massive changes occurring in automation and new technology. Don’t pursue industries with limited shelf lives; look to the future. Equip young people with the skills to survive in the future economy. When establishing industrial zones, thought must be given to overcoming constraints and enabling backward linkages. Make sure these zones can employ Saudi nationals, and not just cheap labor from abroad. Keep reforming the areas that have contributed heavily to building the deficit, especially subsidies. Establish a clear approach to the social and cultural impact of reforms. Empower civil society to act as a counterweight to conservative elements in society that have an entrenched and dominant voice. Empowering women and bringing them into the workforce will be vital to the success of this project. Create a space for workers to voice their grievances. Saudi Arabia needs to continue to develop its capacity to respond to the challenges of the region because the country has an important role to play. Enthusiasm and expectations for the administration of President Donald J. Trump in Washington must be managed carefully. Don’t overload the cart. Find an effective means to respond to Iranian aggression while also pursuing a positive coexistence. The Gulf states are acknowledging a difficult truth: the oil and gas–powered, state-led economic development model that lifted them from isolation and poverty less than a century ago must change.